A project is like a good book: As you complete one chapter you start the next, but sometimes you cannot wait and you read ahead. The LCLS-II project, a next-generation X-ray light source being built at SLAC, one that is based on a superconducting RF electron linac operating in continuous-wave mode, has completed Chapter One – the prototype cryomodule (pCM). And now we are already well into the assembly of the second, third and fourth cryomodules. As one of the partner labs, Fermilab is responsible for the design of LCLS-II’s 1.3-gigahertz cryomodules, as well as assembly and testing for 19 of them. (LCLS-II will have a total of 40 of these cryomodules, and Jefferson Lab is assembling the rest.) Additionally, Fermilab is designing and will assemble and test three 3.9-gigahertz cryomodules and has responsibility for the procurement of the cryogenic distribution system for the LCLS-II linear accelerator. The pCM assembly and testing have been very successful, due in large part to the technical skills and dedication to quality of our entire team. Still, it was a learning experience, which has made our SRF and cryogenic organizations in the Accelerator and Technical divisions stronger and more tightly connected. The pCM met most of its acceptance criteria, to the point where it could be used in the LCLS-II linac. The majority of the design has been verified; the energy gain exceeds the specification; the average quality factor exceeds the goal and sets a new world record (3.0 x 1010); the superconducting magnet meets specification; the new tuner design was verified; the modified fundamental power coupler (in continuous-wave operation) was shown to meet specification; instrumentation and controls worked as planned; and the implementation of magnetic hygiene (first time in a cryomodule) was very successful. The one issue that remains is to reduce the microphonics levels so as to allow better amplitude and phase control of the cryomodule’s eight accelerating cavities, which must operate in unison. I must stress again how this success was driven by our team effort. Particularly evident in the pCM testing was the ability of the Technical and Accelerator division personnel to work together to accomplish the task at hand. The challenge to design, build and test the prototype CM drew on the work of a wide range of team members across many organizations. From beginning to end, the team functioned well. Contributions were made by staff responsible for design, procurement, part inspection, component handling and transportation, cavity testing and qualification, machining and welding, string assembly, cryomodule assembly, leak checking, installation, RF power and controls, cryogenics, and testing. In all, more than 150 individuals at Fermilab are contributing to the LCLS-II effort, and each has reason to be proud of their work. I am very fortunate to be able to lead this team, and I’m thankful for their dedication and strong efforts. Just as with a good book, once you start reading you cannot put it down; the better the book, the more motivated you are to complete reading it. So it is with this project as we are now into the execution phase. We have gotten a taste of our first success and look forward to the next chapters of the story and to completing our work. Rich Stanek is the Fermilab LCLS-II senior team leader. Tens of thousands of accelerators exist around the world, producing powerful particle beams for the benefit of medical diagnostics, cancer therapy, industrial manufacturing, material analysis, national security, and nuclear as well as fundamental particle physics. Particle beams can also be used to produce powerful beams of X-rays. Many of these particle accelerators rely on artfully crafted components called cavities. The world’s longest linear accelerator (also known as a linac) sits at the Department of Energy’s SLAC National Accelerator Laboratory. It stretches two miles and accelerates bunches of electrons to very high energies. The SLAC linac has undergone changes in its 50 years of operation that illustrate the evolution of the science of accelerator cavities. That evolution continues and will determine what the linac does next. An accelerator cavity is a mostly closed, hollow chamber with an opening on each side for particles to pass through. As a particle moves through the cavity, it picks up energy from an electromagnetic field stored inside. Many cavities can be lined up like beads on a string to generate higher and higher particle energies. When SLAC’s linac first started operations, each of its cavities was made exclusively from copper. Each tube-like cavity consisted of a 1-inch-long, 4-inch-wide cylinder with disks on either side. Technicians brazed together more than 80,000 cavities to form a straight particle racetrack. Scientists generate radiofrequency waves in an apparatus called a klystron that distributes them to the cavities. 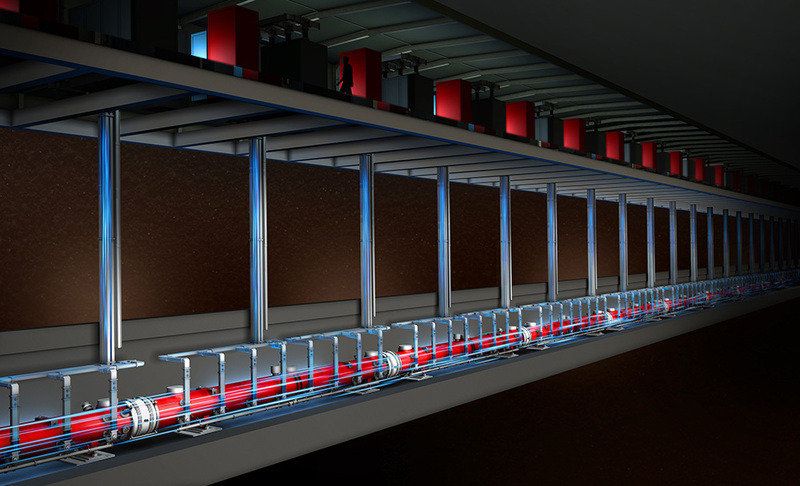 Each SLAC klystron serves a 10-foot section of the beam line. The arrival of the electron bunch inside the cavity is timed to match the peak in the accelerating electric field. When a particle arrives inside the cavity at the same time as the peak in the electric field, then that bunch is optimally accelerated. In its original form, SLAC’s linac boosted electrons and their antimatter siblings, positrons, to an energy of 50 billion electronvolts. Researchers used these beams of accelerated particles to study the inner structure of the proton, which led to the discovery of fundamental particles known as quarks. Today almost all accelerators in the world—including smaller systems for medical and industrial applications—are made of copper. Copper is a good electric conductor, which is important because the radiofrequency waves build up an accelerating field by creating electric currents in the cavity walls. Copper can be machined very smoothly and is cheaper than other options, such as silver. “Copper accelerators are very robust systems that produce high acceleration gradients of tens of millions of electronvolts per meter, which makes them very attractive for many applications,” says SLAC accelerator scientist Chris Adolphsen. Today, one-third of SLAC’s original copper linac is used to accelerate electrons for the Linac Coherent Light Source, a facility that turns energy from the electron beam into what is currently the world’s brightest X-ray laser light. Researchers continue to push the technology to higher and higher gradients—that is, larger and larger amounts of acceleration over a given distance. “Using sophisticated computer programs on powerful supercomputers, we were able to develop new cavity geometries that support almost 10 times larger gradients,” Tantawi says. “Mixing small amounts of silver into the copper further pushes the technology toward its natural limits.” Cooling the copper to very low temperatures helps as well. Tests at 45 Kelvin—negative 384 degrees Fahrenheit—have shown to increase acceleration gradients 20-fold compared to SLAC’s old linac. For this reason, crews at SLAC are in the process of replacing one-third of the original copper linac with cavities made of niobium. Niobium can support very large bunch rates, as long as it is cooled. At very low temperatures, it is what’s known as a superconductor. You can find superconducting niobium cavities in modern particle accelerators such as the Large Hadron Collider at CERN and the CEBAF accelerator at Thomas Jefferson National Accelerator Facility. 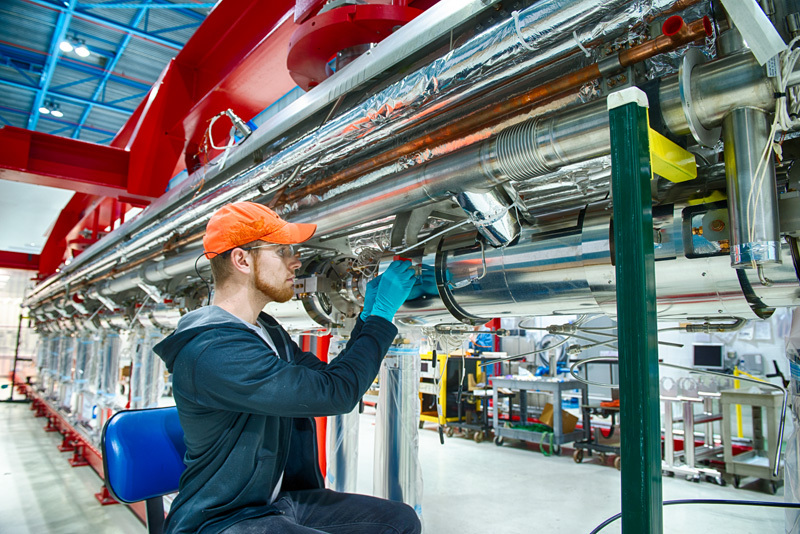 The European X-ray Free-Electron Laser in Germany, the European Spallation Source at CERN, and the Facility for Rare Isotope Beams at Michigan State University are all being built using niobium technology. Niobium cavities also appear in designs for the next-generation International Linear Collider. At SLAC, the niobium cavities will support LCLS-II, an X-ray laser that will produce up to a million ultrabright light flashes per second. The accelerator will have 280 cavities, each about three feet long with a 3-inch opening for the electron beam to fly through. Sets of eight cavities will be strung together into cryomodules that keep the cavities at a chilly 2 Kelvin, which is colder than interstellar space. Each niobium cavity is made by fusing together two halves stamped from a sheet of pure metal. The cavities are then cleaned very thoroughly because even the tiniest impurities would degrade their performance. The shape of the cavities is reminiscent of a stack of shiny donuts. This is to maximize the cavity volume for energy storage and to minimize its surface area to cut down on energy dissipation. The exact size and shape also depends on the type of accelerated particle. 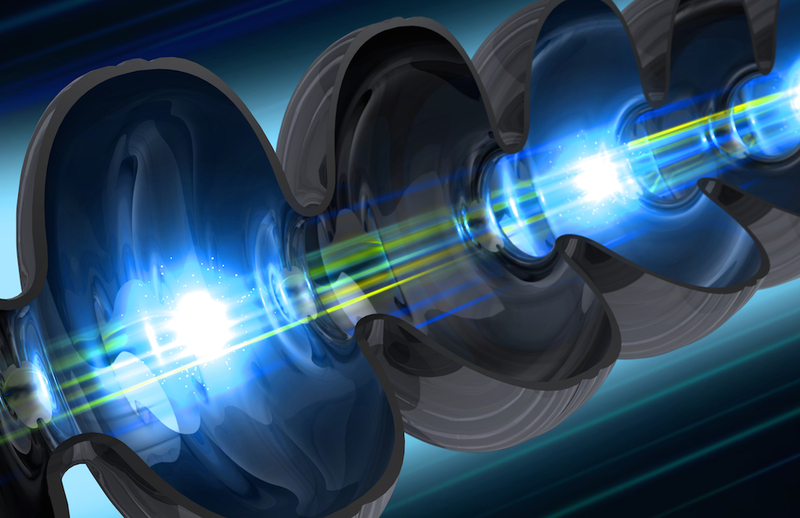 Over the past few years, SLAC accelerator scientists have been working on a way to push the limits of particle acceleration even further: accelerating particles using bubbles of ionized gas called plasma. Plasma wakefield acceleration is capable of creating acceleration gradients that are up to 1000 times larger than those of copper and niobium cavities, promising to drastically shrink the size of particle accelerators and make them much more powerful. Hogan’s team at SLAC and collaborators from the University of California, Los Angeles, have been developing their plasma acceleration method at the Facility for Advanced Accelerator Experimental Tests, using an oven of hot lithium gas for the plasma and an electron beam from SLAC’s copper linac. Researchers create bubbles by sending either intense laser light or a high-energy beam of charged particles through plasma. They then send beams of particles through the bubbles to be accelerated. When, for example, an electron bunch enters a plasma, its negative charge expels plasma electrons from its flight path, creating a football-shaped cavity filled with positively charged lithium ions. The expelled electrons form a negatively charged sheath around the cavity. This plasma bubble, which is only a few hundred microns in size, travels at nearly the speed of light and is very short-lived. On the inside, it has an extremely strong electric field. A second electron bunch enters that field and experiences a tremendous energy gain. Recent data show possible energy boosts of billions of electronvolts in a plasma column of just a little over a meter. Much more R&D work is needed before plasma wakefield accelerator technology can be turned into real applications. But it could represent the future of particle acceleration at SLAC and of accelerator science as a whole. The bulk of the equipment that was removed had been installed in the original 1960s linac construction. (For a detailed look at the accelerator fabrication, see this 1967 film.) The accelerator underwent numerous changes over the decades, however, including the addition of the SLAC Energy Doublers, which boosted the power to the accelerator in the 1970s, and the installation of upgraded klystrons – microwave tubes that power the accelerator – as part of the SLAC Linear Collider constructed in 1983. The cryomodules are being built at Fermi National Accelerator Laboratory [FNAL] and the Thomas Jefferson National Accelerator Facility [JLab]. Working on the string of the LCLS-II prototype cryomodule at FNAL. Before they are delivered to SLAC and installed, new infrastructure will go into the accelerator tunnel, including hookups to water and power. Above ground, solid-state microwave amplifiers will replace klystrons in the gallery. “LCLS-II is an impressive undertaking that relies on many teams, multiple successful phases and important collaborations with our partners – Argonne National Laboratory, Lawrence Berkeley National Lab, Fermilab and Jefferson Lab – and Cornell University,” said John Galayda, head of the LCLS-II project team. “We are making steady progress toward the start of operations in 2020. Researchers at the Department of Energy’s SLAC National Accelerator Laboratory are playing key roles in two recently funded computing projects with the goal of developing cutting-edge scientific applications for future exascale supercomputers that can perform at least a billion billion computing operations per second – 50 to 100 times more than the most powerful supercomputers in the world today. The first project, led by SLAC, will develop computational tools to quickly sift through enormous piles of data produced by powerful X-ray lasers. The second project, led by DOE’s Lawrence Berkeley National Laboratory (Berkeley Lab), will reengineer simulation software for a potentially transformational new particle accelerator technology, called plasma wakefield acceleration. The projects, which will each receive $10 million over four years, are among 15 fully-funded application development proposals and seven proposals selected for seed funding by the DOE’s Exascale Computing Project (ECP). The ECP is part of President Obama’s National Strategic Computing Initiative and intends to maximize the benefits of high-performance computing for U.S. economic competiveness, national security and scientific discovery. X-ray lasers, such as SLAC’s Linac Coherent Light Source (LCLS) have been proven to be extremely powerful “microscopes” that are capable of glimpsing some of nature’s fastest and most fundamental processes on the atomic level. Researchers use LCLS, a DOE Office of Science User Facility, to create molecular movies, watch chemical bonds form and break, follow the path of electrons in materials and take 3-D snapshots of biological molecules that support the development of new drugs. At the same time X-ray lasers also generate giant amounts of data. A typical experiment at LCLS, which fires 120 flashes per second, fills up hundreds of thousands of gigabytes of disk space. Analyzing such a data volume in a short amount of time is already very challenging. And this situation is set to become dramatically harder: The next-generation LCLS-II X-ray laser will deliver 8,000 times more X-ray pulses per second, resulting in a similar increase in data volumes and data rates. Estimates are that the data flow will greatly exceed a trillion data ‘bits’ per second, and require hundreds of petabytes of online disk storage. As a result of the data flood even at today’s levels, researchers collecting data at X-ray lasers such as LCLS presently receive only very limited feedback regarding the quality of their data. Amedeo Perazzo, director of the LCLS Controls & Data Systems Division and principal investigator for this “ExaFEL” project, says, “We want to provide our users at LCLS, and in the future LCLS-II, with very fast feedback on their data so that can make important experimental decisions in almost real time. The idea is to send the data from LCLS via DOE’s broadband science network ESnet to NERSC, the National Energy Research Scientific Computing Center, where supercomputers will analyze the data and send the results back to us – all of that within just a few minutes.” NERSC and ESnet are DOE Office of Science User Facilities at Berkeley Lab. This project is enabled by the investments underway at SLAC to prepare for LCLS-II, with the installation of new infrastructure capable of handling these enormous amounts of data. A number of partners will make additional crucial contributions. The “ExaFEL” project led by Perazzo will take advantage of Aiken’s newly formed Stanford/SLAC team, and will collaborate with researchers at Los Alamos National Laboratory to develop systems software that operates in a manner that optimizes its use of the architecture of the new exascale computers. Finally, ESnet will provide the necessary networking capabilities to transfer data between the LCLS and supercomputing resources. Until exascale systems become available in the mid-2020s, the project will use NERSC’s Cori supercomputer for its developments and tests. 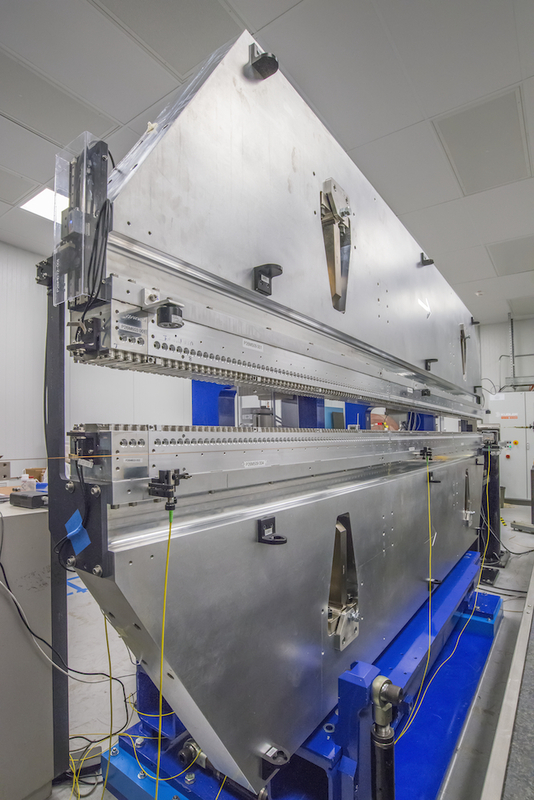 Scientists are installing new mirrors to improve the quality of the X-ray laser beam at the Department of Energy’s SLAC National Accelerator Laboratory. The meter-long mirrors are the ultimate in flatness, smooth to within the height of one atom or one-fifth of a nanometer. If Earth had the same surface, the hills and valleys would only vary by the width of a pencil, says Daniele Cocco, engineering physicist and head of the optics group at SLAC’s Linac Coherent Light Source (LCLS), a DOE Office of Science User Facility. Right now, the mirrors are stored in a clean room to avoid dust and prevent damage. Cocco and other engineers only handle the mirrors while wearing gowns, hairnets, masks and gloves. They’re testing the mirrors to see how they will respond to heat and mechanical stress while the beam is running. Both cause tiny deformations on the surface, and even changes as small as half a nanometer can cause big problems. Five of these mirrors will be installed in LCLS by the beginning of next year and available for experiments in summer 2017. The new arrivals will join the 12 flat and curved mirrors that currently steer and focus light at LCLS, which is almost one mile long. Eventually, the upgraded mirror system will have a total of 28 mirrors. This is the first time the mirrors have been replaced at LCLS. The original mirrors were installed in 2009, when the free-electron laser came online. As the laser strikes the mirrors, some degradation of the reflective surface occurs over time. Since the originals were built, there have been improvements in how the mirrors are made, and engineers also better understand how the mirrors can be tailored to the LCLS beam. When light hits the reflective surfaces, the photons slant toward a specific point. The X-rays are shaped to the need of the experiment, from a focal spot less than a micron in diameter to as wide as a few millimeters. The beam quality also must be preserved in order to reveal the state of molecules and atoms during a range of processes that occur in biology, chemistry, materials science, and energy. A Japanese optics company, JTEC Corporation, fabricates the mirrors for synchrotrons and other X-ray laser research facilities such as Japan’s Spring-8 Angstrom Compact Free-Electron Laser (SACLA) and the European X-ray Free-Electron Laser (EXFEL), located in Hamburg, Germany and due to come online in 2017. Each mirror is made from an individual silicon crystal, artificially grown in a lab. After the mirror is polished with conventional techniques, the company uses a process called elastic emission machining, where a jet of ultra-pure water containing fine particles removes any remaining imperfections atom by atom. Blemishes in the mirror can create imperfections in the X-ray beam. “These latest mirrors preserve the beam quality within 97 percent, and the manufacturing technology is continuing to get better,” Cocco says. With a coherent laser beam, such as the one at LCLS, photons traveling at fixed wavelengths have a specific relationship to each other. The light beam also travels over a long distance, which means any disruption can amplify. Two of the mirrors will be installed adjacent to the front end of the undulator hall at LCLS. The other three will be located 200 meters further down the beam line, in the X-ray transport tunnel between the near and far halls. 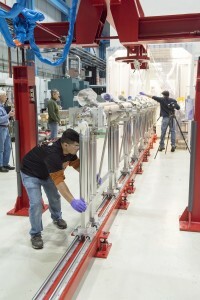 The mirrors will also be able to handle the higher energy range of LCLS-II, the next generation of SLAC’s X-ray laser. Construction begins today on a major upgrade to a unique X-ray laser that will add a second X-ray laser beam that’s 10,000 times brighter, on average, than the first one and fires 8,000 times faster—up to a million pulses per second. Researchers at the Department of Energy’s Lawrence Berkeley National Laboratory (Berkeley Lab) are contributing key components for the project, known as LCLS-II, that will greatly increase the power and capacity of the Linac Coherent Light Source (LCLS), a free-electron X-ray laser at the DOE’s SLAC National Accelerator Laboratory in Menlo Park, Calif. The project, which is now formally approved by the DOE to start construction and is being funded by DOE’s Office of Science, will enable experiments that sharpen our view of how nature works on the atomic level and on ultrafast timescales. Like the existing facility, LCLS-II will use electrons accelerated to nearly the speed of light to generate beams of extremely bright X-ray laser light. The electrons fly through a series of magnets, called an undulator, that forces them to travel a zigzag path and give off energy in the form of X-rays. At present, electrons are accelerated in a copper structure that operates at room temperature and allows the generation of 120 X-ray laser pulses per second. For LCLS-II, crews will install a new accelerator that is called “superconducting” because its metal cavities, made of niobium, will conduct electricity with nearly zero loss when chilled to minus 456 degrees Fahrenheit. Accelerating electrons through a series of these cavities allows the generation of an almost continuous X-ray laser beam. To make the upgrade a reality, a nationwide collaboration has formed that includes SLAC, Berkeley Lab and three other national labs—Argonne, Fermilab and Jefferson Lab—and Cornell University, with each partner making key contributions to project planning as well as to component design, acquisition and construction. “We bring a lot of expertise to the LCLS-II collaboration,” said John Corlett, senior team leader for the LCLS-II effort at Berkeley Lab. “We were selected to provide critical technologies that generate the high-brightness and high-repetition-rate electron beam that is the first component in the superconducting accelerator chain, and the undulators that are the core of the free-electron laser X-ray source. When LCLS opened six years ago as a DOE Office of Science User Facility, it was the first light source of its kind—a unique X-ray microscope that uses the brightest and fastest X-ray pulses ever made to provide unprecedented details of the atomic world. Hundreds of scientists, including Berkeley Lab researchers, use LCLS each year to catch a glimpse of nature’s fundamental processes in unprecedented detail. Molecular movies reveal how chemical bonds form and break; ultrafast snapshots capture electric charges as they rapidly rearrange in materials and change their properties; and sharp 3-D images of disease-related proteins provide atomic-level details that could hold the key for discovering potential cures. The new X-ray laser will work in parallel with the existing one, with each occupying one-third of SLAC’s 2-mile-long linear accelerator (“linac”) tunnel. Together they will allow researchers to make observations over a wider energy range, capture detailed snapshots of rapid processes, probe delicate samples that are beyond the reach of other light sources and gather more data in less time, thus greatly increasing the number of experiments that can be performed at this pioneering facility. SLAC is now clearing out the first third of the linac to make room for the superconducting accelerator, which is scheduled to begin operations in early 2020. In February, a Fermilab team came together to witness a moment they’d looked forward to for over a year. Crew members parted the plastic sheeting at one end of a cleanroom and rolled out on narrow tracks a long string of eight accelerating cavities. 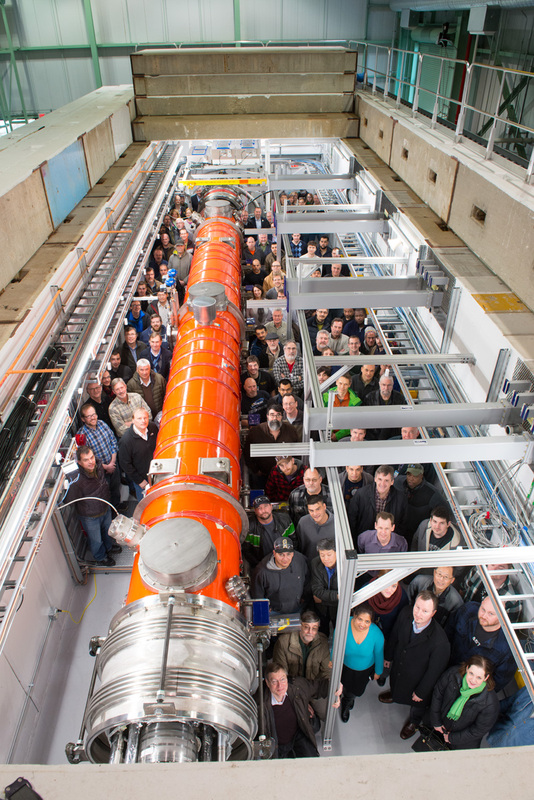 It was the first cavity string for LCLS-II, which will greatly increase the power and capacity of SLAC’s Linac Coherent Light Source. Accelerating cavities are structures that impart energy to a particle beam, and they’re the heart of the cryomodule — a major accelerator section — that Fermilab has designed and is building for LCLS-II. 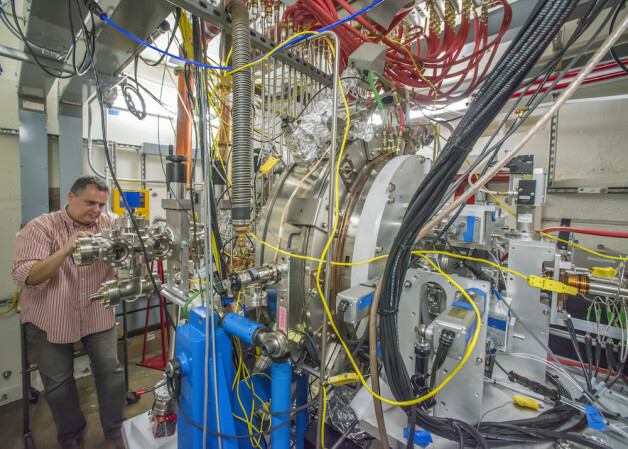 SLAC’s LCLS-II is a powerful X-ray laser that will allow scientists to glimpse nature’s fundamental processes on an atomic level and ultrafast time scales. Today SLAC announced DOE approval of the start of construction for LCLS-II. Since the rollout, the Fermilab team has been outfitting the cavity string with cooling equipment, instrumentation and structural support to form the cryomodule. By summer, they will have completed their first one. The cryomodule is destined for LCLS-II’s new superconducting linear accelerator. Electrons speeding down the accelerator will generate an almost continuous X-ray laser beam with pulses of up to a million times per second — thousands of times faster than the current LCLS puts out. To be superconducting, the cryomodule’s cavities, made of niobium, must operate at minus 456 degrees Fahrenheit. The linear accelerator backbone of LCLS-II comprises 37 cryomodules. Thomas Jefferson National Accelerator Facility in Virginia, another LCLS-II collaborating institution, will build 18 cryomodules of this type. Fermilab is building 17 of these cryomodules plus two that will operate at a higher frequency. The boost from a pulsed beam to a continuous one means that the new accelerator will require much more power to operate. And with great power comes the need for great efficiency. That’s why Fermilab scientists have, for the better part of a decade, been working on methods for building and treating cavities to be as efficient as they can be. By imparting maximum energy to the beam with minimal energy loss, efficient cavities help drive down the cost. Last year, the Fermilab team reported a world-record quality factor, an indicator of the cavity’s efficiency in minimizing thermal losses. “The performance of the individually tested cavities that were put into the string was far beyond anything that has been put into such a cryomodule before,” Ross said. Fermilab also designed the cryomodule’s instrumentation to be able to handle the high power and its plumbing system to carry away heat. “With continuous-wave operation, there’s a much higher heat load than there is with pulsed-beam acceleration, so everything has to be more robust,” said Fermilab’s Elvin Harms, who leads cryomodule testing for LCLS-II at Fermilab. Scientists and engineers specially designed the couplers that transfer the radio-frequency power to the cavities with thicker, high-conductivity plating, for example, to carry away the high heat load. The assembly process to this point has been painstaking, said Fermilab scientist Anna Grassellino, who is responsible for cavity preparation and testing for LCLS-II. And it promises to remain that way until the cryomodule is finally delivered to SLAC. Technicians who successfully assembled the first cavity string in the cleanroom spent two weeks carefully putting the components together. Following a protocol established at DESY in Germany and Saclay in France and borne out in tests at the Fermilab Accelerator Science and Technology facility, they moved in slow motion, since too-rapid movements would create particulates that could make their way into the cavity, degrading its operation in an accelerator. Crews are carefully installing shielding to protect the cavities from Earth’s magnetic field, which would ruin their performance; welding the cavity string to the plumbing for the super-cooled helium that will keep the cavities cold; and connecting everything structurally inside the vacuum vessel. Cryomodule tests will begin early this summer. Fermilab and Jefferson Lab plan to move the completed cryomodules to SLAC toward the end of 2016. LCLS-II, like its predecessor LCLS, will be a DOE Office of Science User Facility. If you’ve ever stood in a dark room wishing you had a flashlight, then you understand how scientists feel when faced with the mysteries of physical processes that happen at scales that are mind-bogglingly small and fast. The future of life-changing science – science that will spawn the electronic devices, medications and energy solutions of the future – depends on being able to see atoms and molecules at work. To do that you need special light – such as X-ray light with a wavelength as small as an atom – that pulses at the rate of femtoseconds. A femtosecond is to a second what a second is to 32 million years. It is the timescale for the basic building blocks of chemistry, biology and materials science. That’s why, six years ago, the Department of Energy’s SLAC National Accelerator Laboratory answered a bold call by the scientific community: Build a transformative tool for discovery, an X-ray laser so bright and fast it can unravel the hidden dynamics of our physical world. Since it began operation in 2009, this singularly powerful “microscope” has generated molecular movies, gotten a glimpse of the birth of a chemical bond, traced electrons moving through materials and made 3-D pictures of proteins that are key to drug discovery. Known to scientists as an X-ray free-electron laser (XFEL), SLAC’s Linac Coherent Light Source, or LCLS, is a DOE Office of Science User Facility that draws many hundreds of scientists from around the world each year to perform innovative experiments. The success of LCLS has inspired the spread of such machines all over the world. The latest issue of Reviews of Modern Physics contains the most comprehensive scientific overview of its accomplishments in a paper entitled, Linac Coherent Light Source: The First Five Years. LCLS staff scientists devoted about a year to compiling the collection of reports, says LCLS Director Mike Dunne. Here are five ways SLAC’s X-ray laser and the science it enables can impact our future. LCLS studies are helping to home in on the most promising materials and methods for transforming the electric power grid and driving next-generation computer components beyond classical limits. To make computers and other electronics faster and smaller, scientists need to understand and control materials’ magnetism and electronic behavior in new and more precise ways. LCLS has given us new, nanoscale views of how laser light rapidly flips the magnetic state of materials, providing new insight on how to write data with light. It has pinpointed the speed of electrical switching – such as what occurs in semiconductor transistors – with trillionth-of-a-second precision. Researchers at LCLS have also discovered a new, 3-D phenomenon that may be linked to high-temperature superconductivity, which allows some exotic materials to conduct electricity with zero resistance. The ability to take direct measurements of never-before-seen steps in chemical reactions is what scientists need to design more efficient reactions to produce fuels, fertilizers and industrial chemicals. While we know the starting ingredients and outcomes of chemical reactions, the early and middle steps are hard to see in real time at the atomic scale. LCLS X-ray pulses are so fast that they allow us to observe and analyze these previously unseen steps. They work like ultrabright flashes to capture X-ray snapshots of chemical reactions as they happen. Researchers have used LCLS to see new details of a reaction in catalytic converters that neutralizes pollution from car exhaust, and to produce “molecular movies” of a molecule transforming after one of its chemical bonds breaks. Half of the medications on the market target special receptor proteins in the outer layer of our cells. To figure out how drugs work so we can make them more effective and reduce side effects, we need to see how they dock with these receptors in atom-by-atom detail. The best way to see how they fit is to form the protein-drug complexes into crystals and study them with X-rays, but many important samples don’t form big enough crystals or are too damage-prone for conventional X-ray tools. LCLS, though, can study very tiny crystals under more natural conditions, making it possible to determine the 3-D atomic structure of important proteins that had been out of reach. Already, LCLS has revealed a potential weakness in a protein involved in the transmission of African sleeping sickness, provided the best 3-D atomic-scale look at how blood pressure medicines and painkillers interact with receptors in our cells, and pinpointed the mechanism that allows our brain to send ultrafast chemical signals. In more recent studies, LCLS has also been used to image living bacteria that are responsible for generating the oxygen in our atmosphere, demonstrating an entirely new X-ray imaging technique. LCLS allows us to study how plants use energy from sunlight to release oxygen into the air we breathe during a process called photosynthesis. The X-ray laser is uniquely capable of mapping the individual sunlight-triggered steps. Early data is already giving us a detailed understanding of photosynthesis – information that’s crucial for developing renewable, clean sources of energy that mimic nature. Scientists are also using the tool to study how light affects other living things. Just as sunlight can be life-giving, it can also be damaging. Studies at LCLS have revealed how our DNA protects itself from the sun’s ultraviolet rays and how proteins in bacteria and in our eyes shift shape in response to light. High-power laser systems at SLAC heat matter to millions of degrees and crush it with billions of tons of pressure per square inch. Scientists use LCLS to measure what happens to matter under these extreme conditions with high precision at very small scales, and over very short periods of time. Some studies test the resilience of materials, such as those used in jet engines, to see how they fail. Others have simulated and studied the shock effects of meteorite impacts and have reproduced the conditions that are believed to exist at the heart of giant gas planets, which improves our understanding of how solar systems form. The results also give scientists new insight into how to replicate the fusion reactions that fuel our sun, an essential step in the pursuit of fusion energy as a power source. “The Linac Coherent Light Source: The First Five Years,” was authored by a team representative of the X-ray and accelerator science groups at SLAC during this pioneering period of XFEL science: Christoph Bostedt, Sébastien Boutet, David M. Fritz, Zhirong Huang, Hae Ja Lee, Henrik T. Lemke, Aymeric Robert, William F. Schlotter, Joshua J. Turner and Garth J. Williams. Citation: Bostedt, et al., Reviews of Modern Physics, 9 March 2016 (10.1103/RevModPhys.88.015007).